The title of this piece was inspired by the Jesus Christ Church of Latter-day Saints. Some name condensation has occurred here — strictly for the purpose of equation with the ‘latter-day saints’ currently unrestrainedly straddling Nigerian politics. Otherwise, the full name of the church in question is: The Church of Jesus Christ of Latter-day Saints (also known as the LDS Church or, informally, the Mormon Church). Founded by controversial figure Joseph Smith, the LDS is a nontrinitarian church that began in the United States in 1830 as the restoration of the original church founded by Jesus Christ. However, it’s string of questionable doctrines — LDS teachings, for example, are based on the Bible, the Book of Mormon, the Doctrine and Covenants, and the Pearl of Great Price — have left the rest of the Christendom analyzing it as a variation rather than a restoration of the old church. Smith’s killing, at 48 in 1844, by an armed mob was the culmination of a two-way crisis, a part of which was his attempt to marry the wives of William Law, his trusted counsellor, and Robert Foster, a General of the Nauvoo (in Illinois) Legion. In Nigerian politics, something similar but not exactly identical is playing out. One or two individuals are talking, permutating, planning to restore Nigeria to the era of the same democratic ideals they either tried to destroy or failed to actualise in their prime. In church parlance, I present to you these latter-day political-space saints. Were we to name a spiritual head for the church of sanctimonious Nigerian politicking, the choice would be Ibrahim Babangida, former military dictator who foisted himself on the country for eight years after overthrowing Buhari in a coup in 1985 (Add traitor, if you want, because he was Buhari’s Chief of Army Staff at the time of the coup.). IBB earned this exalted position at the pulpit of political sainthood because he “shared my thoughts with fellow compatriots” in the form of a press statement opposing a second term for President Muhammadu Buhari and admonishing the electorate to vote in “younger blood” in 2019. In the very intent of IBB’s speech lies the reason it should never have been uttered. If were a society with a precious sense of history, IBB would have permanently lost his place in the class of Nigerians who should be “sharing their thoughts” on democracy. After all he did to democracy? If there’s a former military ruler who has earned the rights to share his thoughts on democracy, that sole honour belongs to Abdulsalami Abubakar, so far the only soldier to have tasted power and relinquished it. Had Abubakar acted like IBB, perhaps Nigeria would still be stuck in the chaotic era of military rule spectacularly defined by the lack of free speech that IBB took advantage of last week. Unfortunately, IBB missed chances upon chances, particularly in the final three years of his tenure, to transform from a former garrison commander to an elder statesman. As many times as the occasion presents itself, we, the people, must not pass up the opportunity to remind IBB of the irrevocable damage he inflicted on democracy by canceling the freest and fairest election the country’s history. The simplest level of viewing the damage is to remember that our democratic maturity is forever set back by six years. As far as robust democracies go, we’re currently where we should have been in 2013! Full marks to IBB. It is absolutely understandable if anyone thought OBJ should have been Senior Pastor, after all it was he who first fired a “special press statement”. Okay, he doesn’t get the Senior Pastor role but he gets a senior role all the same: Officiating Pastor — officiating because he didn’t just fire a letter bomb, he has been active ever since; he has gone on to propose a Coalition for Nigeria Movement and followed it up with a launch during which he registered as a member. 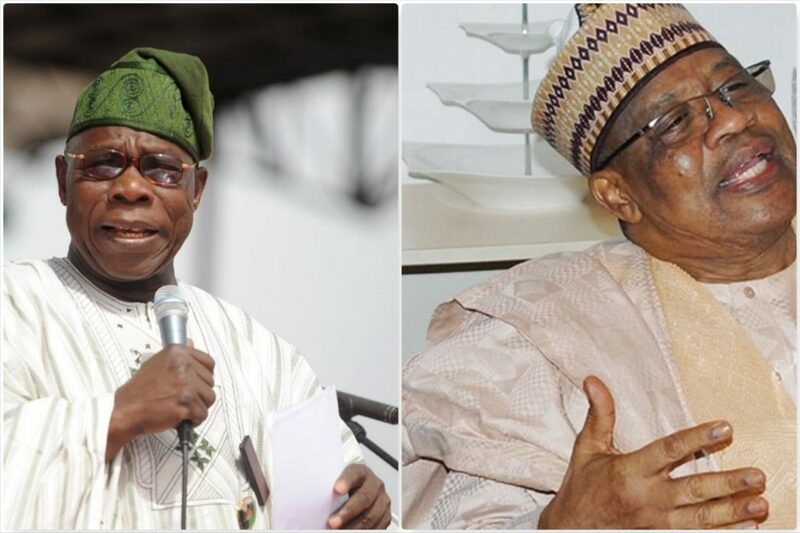 Unlike IBB, the problem is not exactly that Obasanjo cannot commentate on the state of the country; it is his attempt to rewrite history by pretending that all of the country’s current problems postdate his 1999-2007 presidency, plus his failure to practise what he now preaches when he had the chance to. Obasanjo speaks of “corruption and financial crime in the inner caucus of the presidency”, but ask any former or current legislator to name the individual who has helped the most to perpetuate a culture of corruption in the legislature and there can only be one name on their lips: Obasanjo. The answer remains unchanged if the question is to name the ex-civilian leader who is the least qualified to advise “brother Buhari” to proceed on a “dignified and honourable dismount from the horse”. To both questions, the explanation is that short-lived third-term bid of then President Obasanjo. In one final group of this latter-day political church are those egging IBB and OBJ on — the ones solemnly playing the background music rendering the sermon more soothing to the congregants. They are the likes Olagunsoye Oyinlola, former Osun State Governor; Donald Duke, former Governor of Cross River State; Dupe Adelaja, former Minister of State for Defence; Ahmadu Ali, former PDP Chairman; Akin Osuntokun, Obasanjo’s former spokesman; and Gboyega Isiaka, a two-time Ogun State governorship aspirant who is set to run for the third consecutive time in 2019. All of them say they will work from the background; no political ambition. Oyinlola says “what we are trying to do is [act] like a guardian angel; it is you [the youth] that must decide who is to do what and at what level”. Duke adds that “the new vanguard will lead but we step back and perhaps guide and share our experiences which may serve as guide to the new generation”. But nothing could be farther from the truth. This coalition is an association political office-seekers and ‘godfatherism aspirants’ simply latching on to Buhari’s underperformance to realise their inordinate crave for power. To be clear, Obasanjo and IBB have said nothing but the truth; there is an overwhelming consensus among the party neutrals that Buhari has fallen immeasurably short of the expectations and the promises of 2015. To have such voices echo the same thought is very useful. It is just worrisome that those who were part of the problems of the past are springing up to anoint themselves heroes, the danger for which would include future scenarios such as Goodluck Jonathan publicly reprimanding an incumbent for corruption in, say, 2030. Ordinarily, IBB in particular shouldn’t even be commentating on national politics again. But this is Nigeria, a country perpetually in lack of true heroes; there is an abundance of messages but nearly an extinction of genuine messengers. Now we’re stuck with latter-day saints and false prophets masquerading as messengers of hope.